Don’t get me wrong, I’m not complaining about the rain, but this kind of weather would have been much more welcome in April or May when things were going brown and shriveling up. Still I love it. It’s perfect for the procrastinating planter and the person who hates to lug the hose from plant to plant (that would be me), and by now even the grass has put on a green color once again! Green grass makes any color look acceptable. I’m finding that gerber daisies are one of my wife’s favorite plants, so on the rare occasion she comes to the nursery who am I to say no? The rain is also not a problem bloom-destroying-wise since my garden seems to wade through a lull at this time of year. There are plenty of blooms which could be gracing my beds right now but I just don’t have many of them in the ground. My garden peaks closer to the midpoint of summer and beyond, and I’m fine with the extra wait since this time of year is when I always seem to be ironing out the last plantings and thinking through all the projects which may still happen… such as widening the front border (again). Up near the house the blue of the ornamental fescue fills in an earlier expansion of the foundation bed, here closer to the street you can’t even make out the extra foot or so I added to this bed, so it barely counts as a project. Sometimes with your nose to the wheel day in and day out you forget that there’s plenty of good coming together while you slave away at the not-so-good. Here if the viewing angle is just right, the front street border looks fairly well put together. A thick mulch of shredded leaves, a nice edge of shredded bark, and removal of nearly half of everything in the bed gives it an ‘under control’ look for at least one month this year. A clean bed edging always helps, but expanding another foot into the lawn really gave some breathing room… I should remember to enforce this rule next year as everything seeds and spreads out into the newly open space! The front street border this morning. 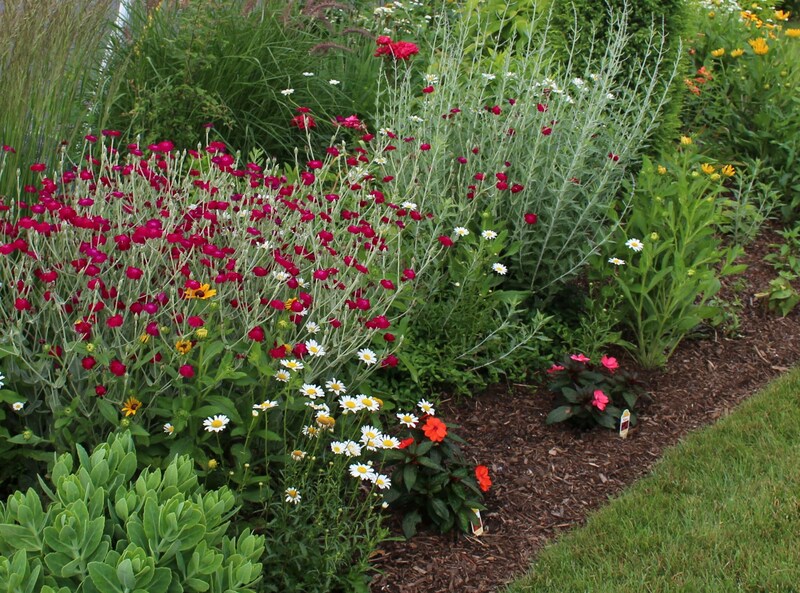 The dark magenta lychnis coronaria and white oxeye daisies are essentially weeds, but if there are just a few I guess it’s socially acceptable. 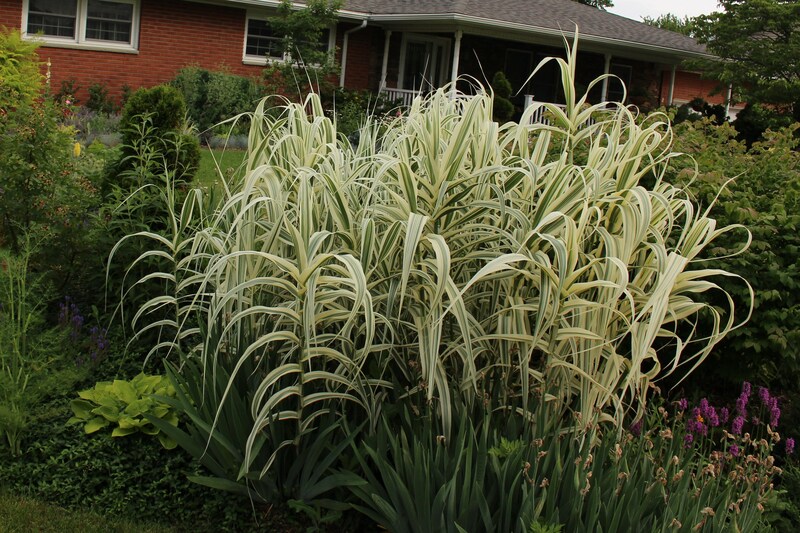 Arundo donax ‘variegata’ overcoming the far end of the street border. Another spreader is the ‘Tiger eyes’ sumac which sits in a couple spots around the yard. For me yellow leaved and chartreuse plants are an addiction and I am constantly in need of reminding of the fine line between a few accents and the way-too-much stage, but the tiger takes care of this on his own. He (actually a she since this clone of cutleaf sumacs produces the colorful red female seed heads when mature) will pepper your beds with small yellow shoots here and there and I suppose someday take over the world, but for now I just pull the innocent little shoots. Pennisetum ‘Karley Rose’ is putting up the first of many fluffy pink seedheads. They’re always dancing about in the wind and keeping things lively. Maybe a few clumps closer to the light pole would look nice next to the bright mess of ‘Tiger Eyes’ which surrounds it right now. For some reason this spring the kids have been coming along on nursery runs. I suspect they have some hidden agenda which includes a stop at the Dollar Store but regardless I’m going to enjoy their company while it lasts. Both insist on helping pick their own plants and sometimes even want to plant. Bright magenta Lychnis coronaria faced down with a few sunpatients. The girl insisted on putting labels front and center, I couldn’t quite get out the reason for it. Also I couldn’t talk her out of the magenta-orange combo. This might have to be replanted once she moves on to other things. The front borders are looking pretty good right now but there are also a few nice surprises out back amongst the weeds. One of my favorites is the first blooms on this strawberry foxglove (Digitalis x mertonensis). It’s been a struggle getting this one to bloom since the harsh winters seem to do a number on the crowns, but this year a few made it, and I finally get to see the strawberry-ish blooms on the relatively short stalks. 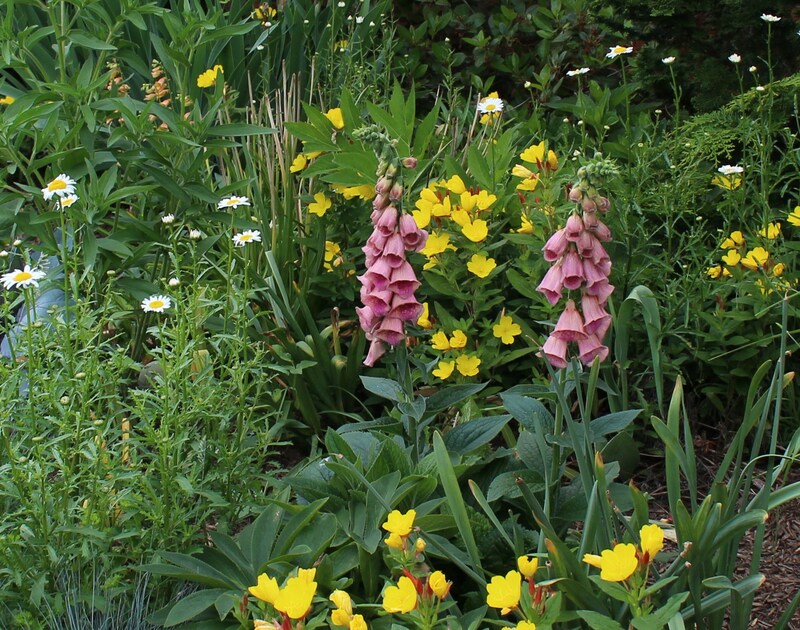 A cross-species hybrid of two foxgloves, the strawberry foxglove should be slightly more perennial than the regular type, and hopefully come true from seed as well. Another spike out in the garden (I like my spiky bloomers) is this verbascum which hitch-hiked in with a gift plant. You know a plant (in this case a shrub dogwood) is coming from a good garden when two special plants tag along on the root ball. This verbascum (maybe V. chaixii?) is blooming nicely now, and follows up some nice scilla blooms which flowered in spring. It was only the dogwood I wanted, but surprises are always fun as well! 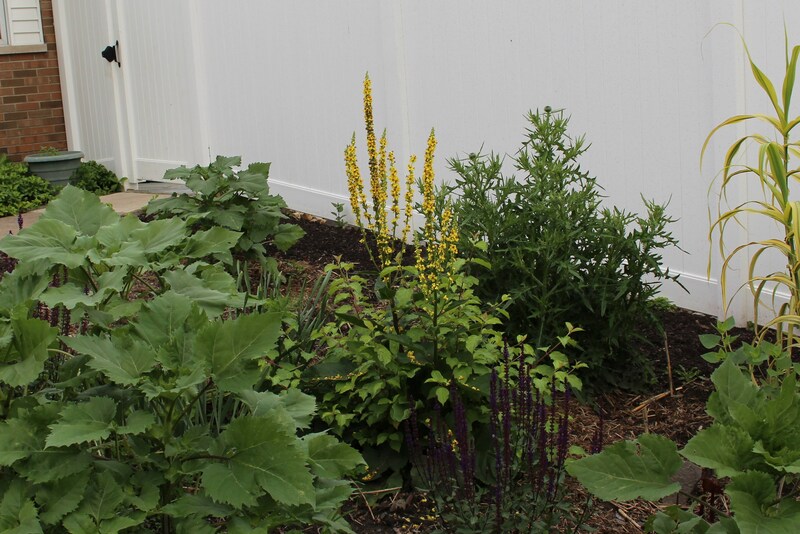 Verbascum blooming amongst the sunflower seedlings which I didn’t have the resolve to rip up….. and yes that’s a huge thistle in front of the fence. I like them, please don’t judge me. Some would call the uninvited sunflower seedlings weeds, many would call the verbascum the same, and many more would immediately rip out the thistle, but I have a more laissez faire approach to the less invasive of the volunteers. 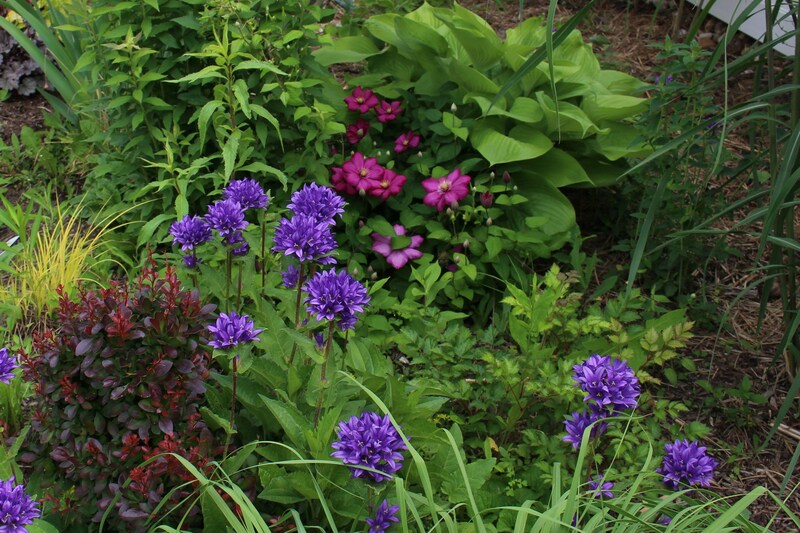 I let plenty of things go, but oddly enough this year the beautiful purple campanula glomerata is what I’m ripping out. I’m trying to reclaim the red border, and it’s the campanula which has made a takeover play. Enough is enough so a few weeks ago roundup was sprayed and it’s only a few pretty stalks which remain. I’ll hand pull these and hopefully with a little summertime vigilance will be able to clear this plant out. Another borderline weedy area is the meadow. Last summer’s dry spell weakened the lawn turf so much that it barely had the strength to send up bloom stalks this spring. That’s a shame since I love the look of the tall grass waving in the wind and enjoy watching the bunnies work their way through each morning filling up on seedheads. But the lazy gardener needs to take these things in stride (I could have made the effort to water last year) and realize the daisies and butterfly weed show up much better in the more open meadow. 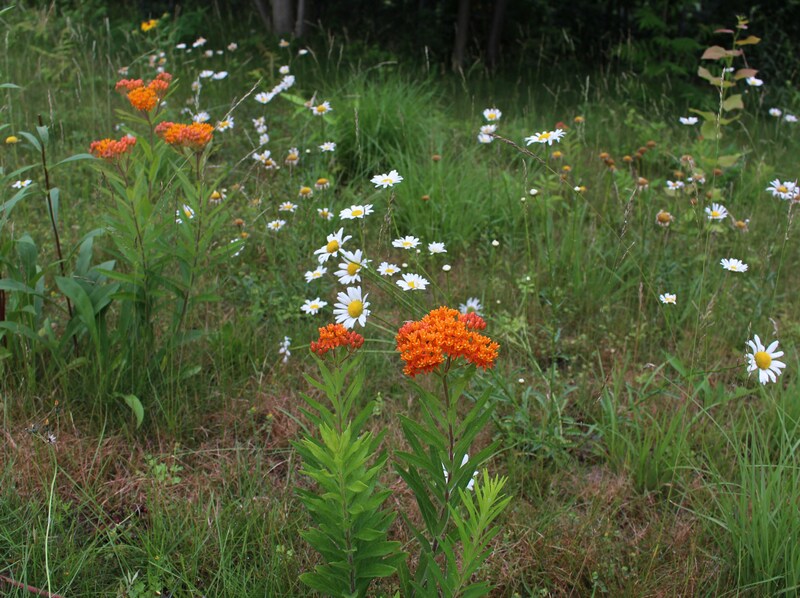 The meadow garden with some particularly drought tolerant butterfly weed (Asclepias tuberosa). Depending on my mood and the weather this area will be mown down in late summer to neaten things up keep the taller plants from dominating. The butterflies are enjoying the meadow, but everything else is focused on the linden blooms (Tilia europaea I think). 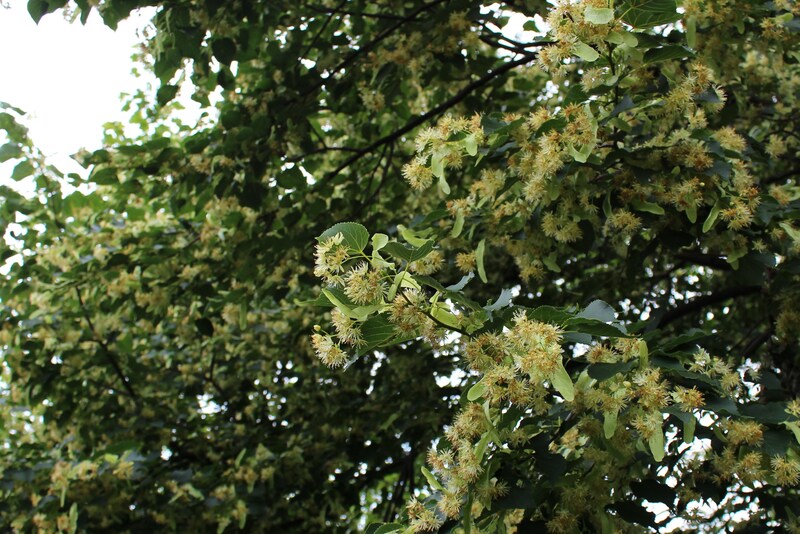 The tree buzzes with honey and bumble bees, flies, beetles, wasps, and a load of other things which I can’t even identify, and the scent is fantastic and fills the yard with a soft flowery honey aroma. It’s a decent size tree and I can’t even imagine the number of insects which fill its branches. If only I could follow the bees home and get a cut of the honey they’re making from all this. June is when the linden tree is in its glory. 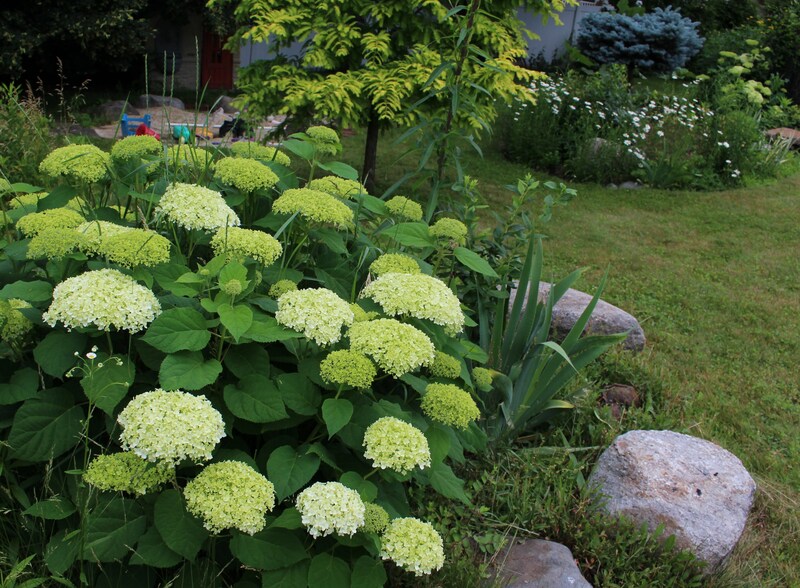 Another plant which does its own thing without me raising a finger is my trusty hydrangea ‘Annabelle’. New hydrangeas will come and go, but I can’t think of a reason good enough to cut this one loose. It can flop, but in the spring it’s cut back completely and between lean living and full sun it holds up well enough. If I had the room I’d do a mass of these, maybe under a grove of white birches, but here all I have room for is a few scattered along the edge of the yard. Obviously I love the chartreuse of the opening blooms best of all since the next best thing to chartreuse foliage is a chartreuse bloom! Hydrangea ‘Annabelle’. You can count on this one to bloom every year. I’ve seen some photos of the newest ‘Annabelle’ siblings and they’re an amazing range or pinks to near reds in addition to the never out of style whites, so I would surely have to add one or two, but I think I’ll always have room for good old ‘Annabelle’. Speaking of room, it’s still a never ending seed starting and cutting taking rollercoaster here and for some reason I still start more. Hopefully I’ll be patting myself on the back when these late marigolds and amaranthus come into bloom and everything else is looking a bit tired! 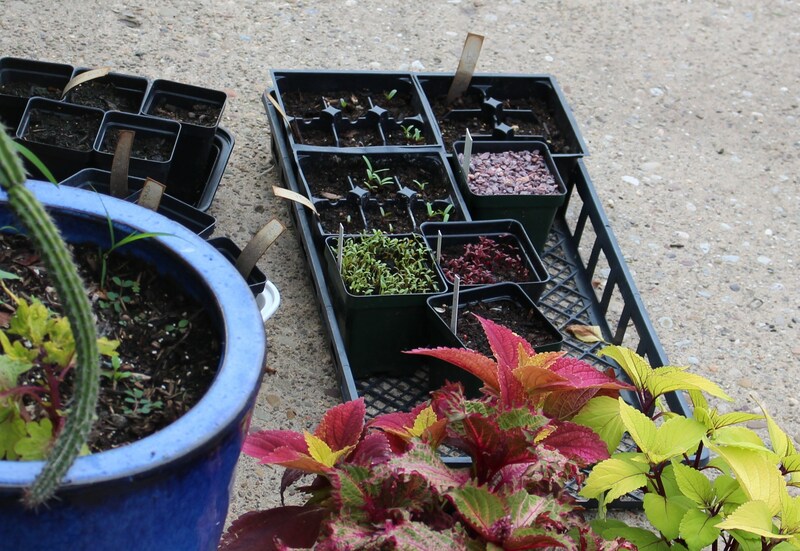 Still sowing seeds and taking cuttings well into June. They grow so fast at this time of year, I should have fresh flowers in no time at all! I better get this posted, it’s been a work in progress since the weekend, not because there’s any amazing content in this post, but because I’m stealing minutes from birthday parties, baseball games, and pool time and would rather sneak in a trip to the nursery than sit at the computer 🙂 But lazy summer days are coming and things should ease up shortly, until then may you enjoy summer as much as I do! 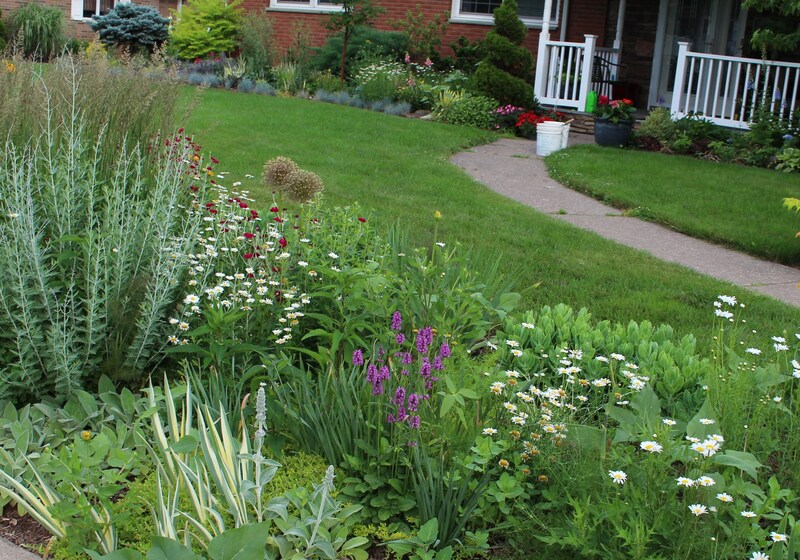 This entry was posted in early summer, fragrant plants, garden design, perennials and tagged flower border, garden design, meadow garden, perennials, Summer. Your garden beds look wonderful, Frank. Lots of color and very neat. I love your meadow, it really is looking meadow-like. Lots of butterflies will be coming your way. The rain and wind here flattened all my Delphinium that was blooming and the sunflowers on the way. We did not get much rain, but terrible winds. The garden now needs lots of work for cleaning up and cutting back. There’s always plenty to do isn’t there, but windstorms and heavy rains don’t make it any easier. Sorry about the delphiniums, mine should be out in another few days so my fingers are crossed for some calm weather next week. Usually it doesn’t work out that way…. For as weedy and messy as the meadow can be I think it’s my favorite part of the yard. There are always surprises! 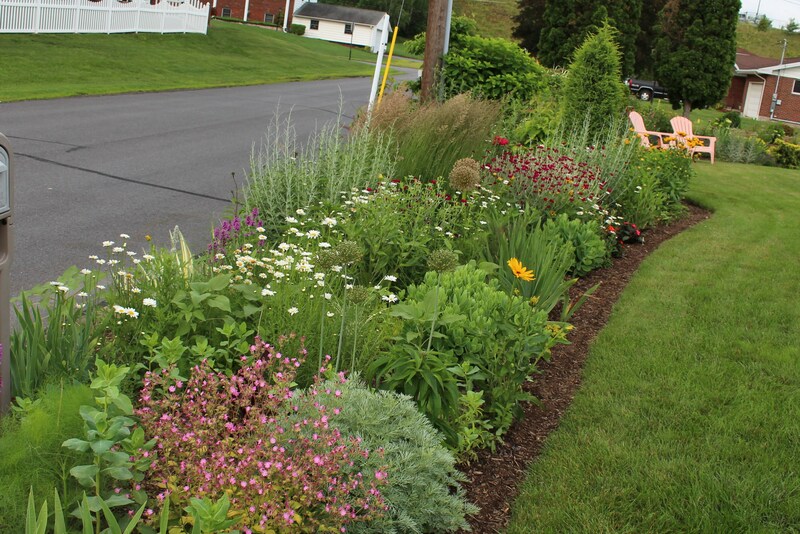 Your garden is looking great, especially that front bed you showed us. And the clematis and campanula really are a nice combination so I hope you spare a few of those campanulas! I am glad you have a linden tree – so loved by the pollinators and such a nice smell too. Our summer has also been late in arriving, but next week should be warming up. Hope your real summer arrives soon too so you can make the most of that beautiful garden you have! Thanks Cathy! I do like the front bed this week but slowly the other parts of the garden are beginning to come together. Someday right? As much as I hate to say it I think all the campanula will go. I love the rich color but don’t trust it enough to turn my back even one minute. Plus when I move plants around it tends to come along, and before I know it there are four or five new patches! Funny your summer has been cool. One would think that after a mild winter things would heat up fast, but I guess that’s not the case. Bloomin’ marvellous! I have Pennisetum ‘Karley Rose’ too, but she doesn’t seem to stay as compact as yours does. I feel a move coming on next year, to somewhere she can have a bit more room. ‘Karley Rose’ stays upright most of the time but is on the floppy side, even in my exposed full sun garden. In another few weeks it will sprawl out a bit, but the stems seem to interlock so you don’t end up with a bald center and it just keeps going and going! Everything looks absolutely stunning. Dare I say that I love the look of the C. glomerata? But I do have a weakness for blues and purples. 😉 The digitalis is lovely also. Have you ever tried Digitalis parviflora ‘Milk Chocolate’? Supposedly hardy to Zone 4 and it went through some rough LI winters without even a blink. I grew it from seed in 2006 and when I sold the place in 2014 it had spread into a very healthy clump. The campanula really is a nice color, and I think if it bloomed just a little longer I would seriously consider giving up a large part of the garden to it… but it doesn’t, so it’s out. I wonder what I can find to replace it? I think I may have a bunch of digitalis seed which I never planted. Maybe next month I’ll get a few of those in the ground and see what they do, but I don’t think I have parviflora. Beautiful! There is plenty in flower, even in the so called ‘lull’. I know what you mean about the fox-gloves, mine are looking horrific at the moment with all of the frosts. That front border along the hellstrip is just perfect – I love how it integrates into the whole yard and makes it feel so much more parklike! Looks great! I especially love Karley Rose – it may be a native to Asia, but it looks right at home in your American garden! Thanks Jayne, Karley Rose is a nice mix of color and grace and it really does liven up the front. ps -I planted a ‘Bengal tiger’ canna last week and thought of you, it’s a long way from blooming but I hope it does well. Do those Tiger Eyes suckers have roots on them? Like you could share one with a gardener? You bet! It’s patent protected but seems to be propagating on it’s own so I think we’re good. I’m always humbled by the work of children and chance, so often my overthinking and overplanning are turned on their ear by something that just happens! ‘Annabelle’ is so hardy and easy to propagate. Let me know if you’d like some this fall or spring there are many more than I want. 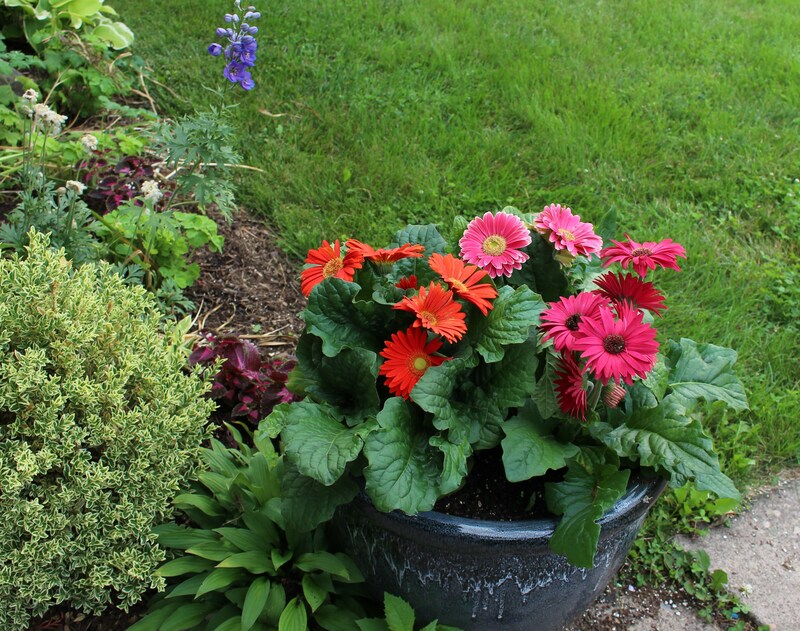 Very attractive plantings. ‘Annabelle’ is on my wish list. That’s a beautiful patch of Lychnis. You have plenty of lychnis as well don’t you? It comes and goes though, this year mine is really putting on a nice show, that’s not always the case. Do you think Annabelle will do as well in warmer zones? I bet there are many hydrangeas which would grow perfectly for you that would freeze out and die here! My red lychnis has died out and several passalongs from a neighbor have been short-lived as well. I grew white ones from seed years ago and they bloom nicely in spring. I just cut them all back. They don’t bloom in this heat (or maybe I need to deadhead them). The rain here seems to come every other day. I feel on the verge of crazy and then I remember it’s good for the plants and so much better than drought. 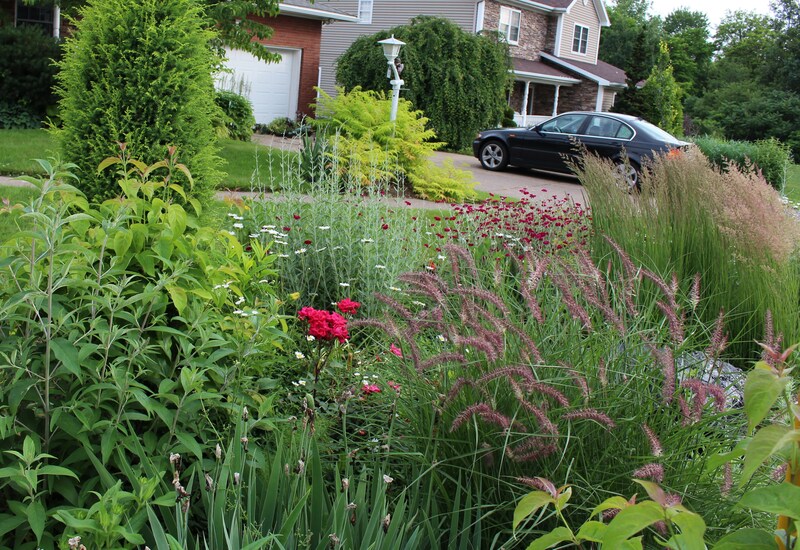 Your front bed with the grasses looks fantastic, also the meadow. You’re right that mulch and clean edges makes a huge difference. I’m convinced that even the most weed infested wasteland will look nice with a clean edge! With all the rain I think you’ll set some new record heights in your garden this year! We had a horrible late spring hot/dry/windy spell that was brutal but have been really moist so far. I’ll take all the rain I can get. Your garden looks great but I can’t believe you put Roundup on your campanula!! Was it really that invasive? I have one small clump. I’ve read there are less invasive varieties though. Once I get past the pain of this one (roundup easily takes care of it) I may have to risk trying a few of the others. How can I resist those blues and purples!? Your garden is looking fantastic Frank. You are lucky having rain, we really need it in this dry corner of the country. But let’ s face it gardeners are never satisfied with the weather. It is actually getting quite warm here which is a bit of a rare treat. Your Hydrangea Annabelle looks amazing. What do you have against that poor Campanula? I think it is really pretty. We went for weeks without more than a trace of rain and now the showers won’t stop. I don’t mind at all and would rather it that way, but would also like to dry out for a few days here and there. Rain and cooler temperatures are one of those things I rarely complain about… Unless it happens to coincide with a long planned garden visit or beach vacation! I’ve heard of your dry hot weather. Just one nice soaking rain is such a relief then and I hope one comes your way soon!